I don't know when this concept crept into my brain. The acronym was added to the Oxford English Dictionary in 2013. This is the OED definition: "Anxiety that an exciting or interesting event may currently be happening elsewhere, often aroused by posts seen on a social media website." 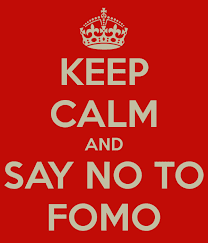 For me FOMO goes way beyond that definition. I fear missing out on knowledge, plays, articles, movies, books, scientific breakthroughs and more. Everything is tantalizingly at my finger tips - one link away. But I can't read it all, learn it all, experience it all. I barricade myself against websites, apps, people that I have no time for. I am like a person who lived under Communist rule shopping in an American supermarket for the first time. FOMO is an artifact of the Internet. Before it, you didn't have FOMO - you knew you were missing out. The reality was you could only surmise that you were missing out on something, somewhere. Ignorance is bliss. Fast forward to the present, Pandora's box has been opened, we have been kicked out of Eden, we know we are missing out. All the time.